Please swipe your card at reception before attending the class which will confirm your attendance. At Inverness Leisure, a valid printed proof of booking will be required to be given to the instructor at the start of the class. Please arrive 5 minutes before the activity starts as late arrivals may not be permitted to participate. 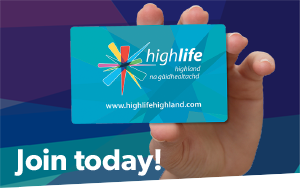 High Life Highland reserves the right to remove any cardholders booking rights if they are found to be abusing the privilege. If you are unable to attend your booking, please ensure you cancel the class well in advance of it starting so that someone else can access your space. Please note that if you book a place and do not attend 3 times within a 2 month period and fail to inform us, your ability to book online will be restricted for 1 month. More excessive misuse may result in the suspension of online booking privileges.